100% HANDMADE CRYSTAL BALL: Each crystal bowl is made of selected high quality octagonal K9 crystals beads. Hollow-carved design delivers a sense of dignity with natural freshness. With its unique fashion and elegant expression of the special passion and artistic taste. DURABLE MATERIALS:All of our tea light holders are decorated with bright octagonal K9 crystals beads and high quality chorm used throughout from the wires to base which is rustless,fadeless and stable. 2.Clean with a soft, dry cloth. 3.For use with a tealight or flameless candle. 【DURABLE MATERIALS】All of our tea light holders are decorated with bright octagonal K9 crystals beads and high quality chorm used throughout from the wires to base which is rustless,fadeless and stable. 【CLASSIC CANDLESTICKS】Add a stately charm to any room with these elegant candlesticks.Very elegant luxurious looking candle holders for any occasion Very elegant & very sturdy. 【MULTIPLE APPLICATION】Fits best on flameless electronic candle or tea light candle, the lights reflected bling bling from the crystals. Ideals for weddings, special events, home decoration, table centerpieces,fireplace ect. 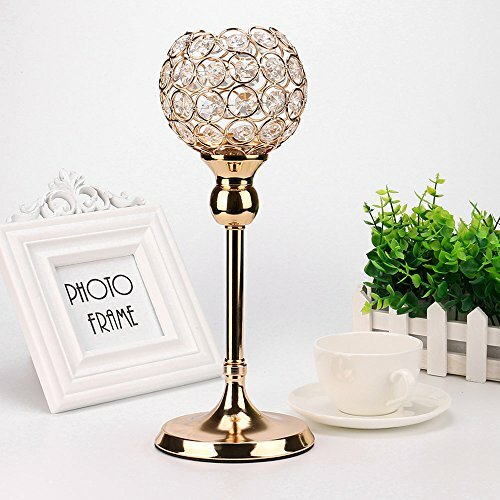 【ELEGANT DESIGN】 his spectacular crystal candle holders comes with a goblet tea light holder sits atop a beautiful pedestal to create a graceful shape. Each crystal bowl is made of selected high quality octagonal K9 crystals beads. With its unique fashion and elegant expression of the special passion and artistic taste. 【HASSLE-FREE RETURNS】From our product quality to customer satisfaction,we strive to provide a pleasant shopping experience by meeting or exceeding your expectations,If you are not completely satisfied within 30 days of your purchase,you can ask for return or replacement. View More In Tea Light Holders. If you have any questions about this product by Basde, contact us by completing and submitting the form below. If you are looking for a specif part number, please include it with your message.